In the under 2-liter class, the dominant Porsches and up-and-coming Lotus cars were challenged by these British-built, Climax-engined Coopers. 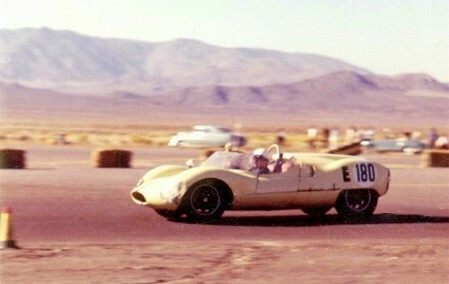 Sacramento's George Grinzewitsch campaigned this ex-Brabham 2 liter Cooper Monaco. He qualified for the Riverside GP in 1961, but DNF'd. In 1962, Grinzewitsch won overall at Cotati twice, taking both the May and August events. Bob Drake drove the car at the Laguna Seca pro race. Movie #8! See Grinzewitsch at Laguna Seca on June 9-10, 1962. Bart Martin bought the car from Grinzewitsch and installed a 5400cc. Chevy V8. He won a string of main events in Northern California in 1964. Jim Herlinger restored the car and raced it in historic events in 1988. Also from Sacramento, Leon Robertson drove this twin to Grinzewitsch's car, shown here at Stead AFB on Sept. 23-24, 1961. He also qualified for the 1961 Riverside GP, but DNF'd as well. Jim Coffin, and later Leon Duhamel, drove this 1500 cc. "Bobtail" Cooper. These cars were a fair match for the older Porsche Spyders.